Fifteen years ago, when I first arrived in Japan, I didn’t know anything about disability in Japanese culture. I didn’t see many people with disabilities on the streets of Tokyo. Disability was not very public. I was told most people with disabilities were hidden away, a combination of lack of access and family shame. However, as I began to discover, disability has been an important, one might even say crucial, part of Japanese culture for a very long time. When I arrived in Tokyo, I was told by a disability studies colleague about the work of Hanada Shuncho. Hanada-sensei had written about the centrality of disability to Japanese culture, especially the disability of Ebisu, one of the shichifukjin, the seven lucky gods. My colleague referred me to a website called “Ebisu Mandala,” but when I loaded the page all I received was an error message. During my first stay in Japan, I had difficulty finding what I was looking for. But when I returned three years later things had changed. Not only were more people talking about including students with disabilities in “mainstream” schools but I also saw more people with disabilities on the streets of Tokyo. And I finally met with Hanada-sensei. By the time of our meeting I had found more disability in things Japanese, especially the blind biwa hoshi. A painting of a seated man who is playing the lute and singing. During the early history of Japan, blindness, often caused by disease, farming accidents, or poor nutrition, was very common. By the eighth century, blind storytellers roamed Japan, chanting narratives in exchange for alms. 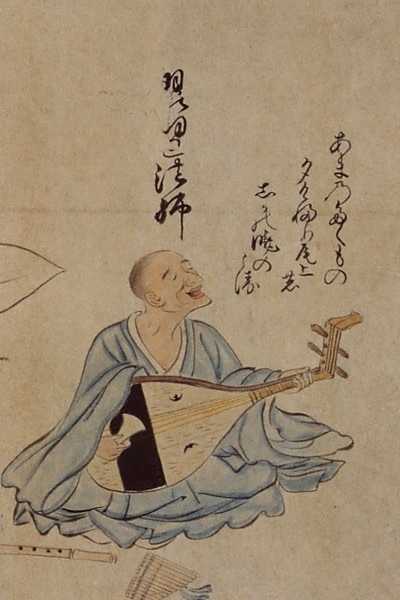 Accompanying themselves on the four-stringed fretted lute called a biwa, the biwa hōshi (lute priests) spread news, popular songs, and local legends. In preparation for meeting Hanada-sensei, I asked my research assistant to translate “History Is Being Created,” Hanada-sensei’s article, in which he relates a Japanese creation myth: After giving birth to the sun and the moon, Izanagino-ko and Izanamino- mikoto, the Japanese version of Adam of Eve, bore a baby whose lower body was paralyzed. He could not speak a word. This child was called Hiru-ko, alluding to Hiru, a leech that roamed the rice paddies and sucked the blood of humans and animals. After Hiru-ko was three years old, still unable to stand upright, he was set to sea on a small boat. His parents abandoned their child; they devoted their life to nation building. The child was never given the name of Mikoto as proof of his divinity. At the places where this boat is said to have arrived to shore are shrines that use the kanji1 for Hiru and Ko. These kanji are now read as Ebisu. By the middle of the Edo period, Ebisu became the most popular of the seven lucky gods, the shichifukujin. The shichifukujin appear in early collections of senryu, short poems consisting of seventeen syllables. In one senryu, it is written that six of the shichifukujin are all katawa, which means incomplete but can also mean distorted or disabled. Thus, the gods who are supposed to bring about fuku, fortune, are the gods with fugu, distortion and disability. Fortunate distortion. A good description of my experience of Japan. According to Hanada-sensei, Ebisu, the deity of prosperity in one’s job has cerebral palsy; Hotei, the deity of prosperity and happiness, is abnormally obese; both Jurojin, deity of happiness, prosperity and longevity, and Fukurokuju, deity of happiness, prosperity, longevity and wisdom, have hydroencephalytic heads; Bishamonten, deity of prosperity has skin and bone structure issues; Daikokuten, the deity who in India fought the evil spirits, and in the 9th century merged with the Shinto deity Okuninushi-no- mikoto to become another Japanese deity of prosperity, has an intellectual disability; and Benten, diety of prosperity and the only female among the shichifukujin, has a sexual abnormality that Handa-sensei said he was too embarrassed to mention in detail. Group picture from the interview. 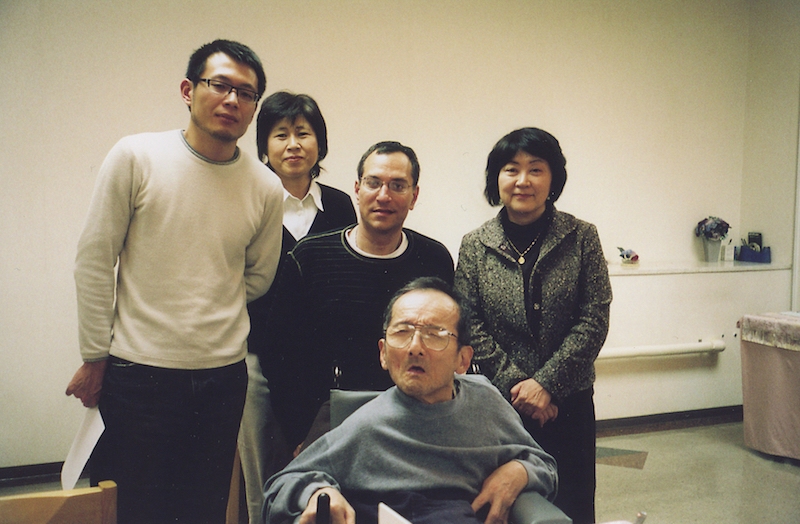 From left to right: Aieo-san, Kohyama Chikako, Kenny Fries, Ueno Etsuko, Hanada Shuncho (seated). I met with Hanada-sensei at the offices of the Japan Society for the Rehabilitation of Persons with Disabilities (JSRPD). He was accompanied by Aeio-san, a graduate student who was familiar with his teacher’s unique speech. During our meeting, Aeio-san served as Hanada-sensei’s interpreter. There was also an interpreter to translate into English from Japanese. Hanada-sensei was born in 1945 with cerebral palsy. Sitting across from me in his wheelchair, he seemed frail. His large-framed glasses accentuated his thin face. His arms were akimbo, each loosely bent over each arm of his wheelchair. Hanada-sensei’s languid speech initially sounded as if it is a recording playing in slow motion. But after a short while, I easily recognized its musical rhythm, which was often interrupted by bursts of laughter. By now, I’ve become accustomed to these kinds of indirect answers. Ebisu, statue outside the Ebisu train station in Tokyo. A bronze statue of a small seated man, smiling and holding a fish, in front of a tiled wall. Hearing this, I thought of the Noh drama Semimaru, which is set at the Osaka Barrier, an old toll station on Osaka Pass, between Kyoto and Lake Biwa. All travelers to and from the eastern provinces had to pass this way; the spot became popular in poetry and tales of ordinary life. Among the beggar- entertainers who frequented the Osaka Barrier, one line of blind, roaming musicians claimed Semimaru as a founder and patron. As these blind biwa singers sang their alluringly lyrical tales throughout Japan, they not only provided access to a common national story, but also helped establish the national language. Later, these musicians elevated Semimaru into a prince. Whether actual or mythic, Semimaru eventually became a godlike figure to many musicians, especially blind performers. He was honored in a shrine near the Osaka Barrier. “How did you come to learn all this?” I asked Hanada-sensei. After meeting Hanada-sensei, I discovered other historical figures with disabilities. During the great Japanese civil wars, the Shingen Takeda family employed Yamamoto, a military general once widely known in Japan. He was ugly, blind in one eye, and had a crippled leg and no fingers. His body was full of scars. Yamamoto’s shrewd military tactics and ability to analyze information was legendary; he could visualize detailed geography, the shape of a castle, the situation of the castle town, and movements of people as if all of this was happening right in front of him. He was able to create a three-dimensional world based on what he gleaned from books and stories. However, the official books by the Takeda family do not mention Yamamoto Kansuke. Nor does any book by the family’s vassals. He is no longer depicted as the brilliant military general he actually was. In Japanese history, as society moved from an imperial society to a warrior society, those deemed physically different disappear. featuring the author, title, and a photo of lit candles. 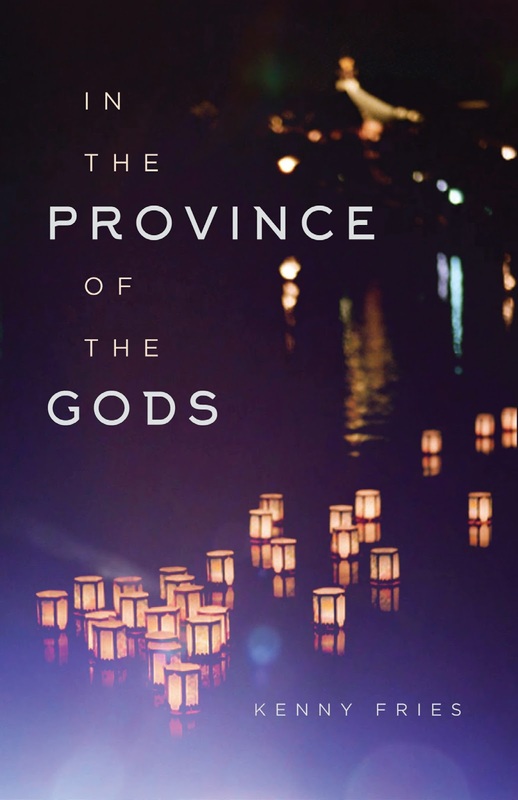 This is an adapted excerpt from Kenny Fries’s In the Province of the Gods, which received the Creative Capital literature grant and will be published this month. His other books include The History of My Shoes and the Evolution of Darwin’s Theory and Body, Remember: A Memoir. He edited Staring Back: The Disability Experience from the Inside Out. He received the Creative Arts Fellowship from the Japan/US Friendship Commission and the National Endowment for the Arts, and has twice been a Fulbright Scholar (Japan and Germany). He teaches in the MFA in Creative Writing Program at Goddard College. Kenny Fries (2017): Meeting Hanada Shuncho: In Search of Disability in Things Japanese. In: Public Disability History 2 (2017) 13.